How to calculate the difference in days between two calendar dates. Home / Support / Documentation / RSForm! Pro / Custom scripting / How to calculate the difference in days between two calendar dates. 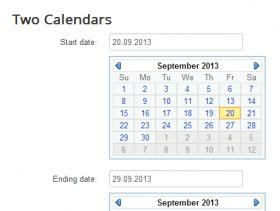 Besides your desired form fields, we will use two calendar fields to select the dates and a textbox field for the output. //getTime() function used to convert a date into milliseconds. This is needed in order to perform calculations. //this is the actual equation that calculates the number of days. //args = object, containing the date in the exact format needed for the above getTime() function. //calendar = object, containing various properties of the calendar. //only when both dates are selected. //the calculation will be done when the dates are selected. //this will assign the days difference value to our textbox. cal5_0 - first number only. This is actually the calendar's ID. The first number, is your form's ID, while the second number is used to distinguish the calendars, 0 means the first calendar. cal5_1 - first number only. This is actually the calendar's ID. The first number, is your form's ID, while the second number is used to distinguish the calendars, 1 means the second calendar. 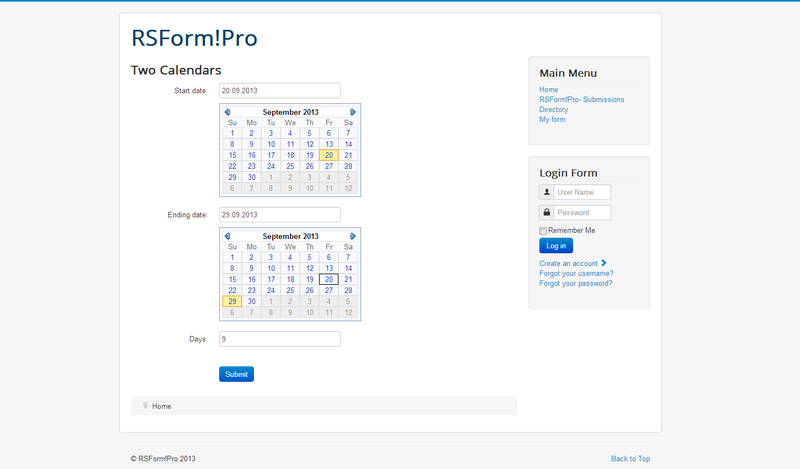 How to further customize the RSForm!Pro calendar field, please refer to the developer guide. Another example using the "rsfp_onSelectDate()" function can be found here. 36 persons found this article helpful.